Air Tanzania Receives First Boeing 787-8 Dreamliner. Air Tanzania must have one of the most interesting aircraft deliveries of the year. The airline previously had a fleet of just three turboprop aircraft, and this year it is receiving a Boeing 787. That is a radical upgrade of the fleet. 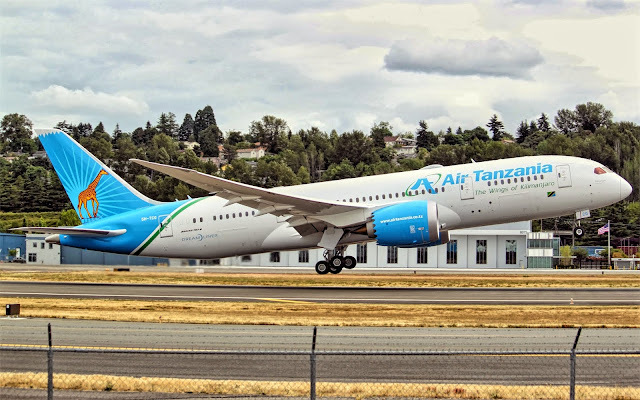 Boeing delivered a 787-8 Dreamliner to Air Tanzania as part of the airline's plan to grow its operations in Africa and international destinations. The new Boeing 787 is the first wide-body aircraft that joins the aircraft carrier fleet of Tanzania. "We are very proud to receive this Boeing 787 Dreamliner," said Ladislaus Matindi, CEO of Air Tanzania. "We believe that this is the perfect aircraft to realize our ambition to connect with the rest of the world through the start of intercontinental flights, I am delighted to be here today with Boeing and Rolls-Royce to celebrate this important milestone." The Boeing 787 Dreamliner is a completely new and super efficient commercial aircraft family, which allows airlines to open new routes profitably so that passengers can travel directly to their destinations and with exceptional comfort. Since 2011, more than 690 Dreamliners have entered service, flying to more than 255 million people, saving approximately 25,000 million pounds of fuel. The Dreamliner family has helped open more than 180 new nonstop routes around the world. "We are honored that Air Tanzania has chosen the 787 Dreamliner to expand its long distance operations both in Africa and internationally," said Marty Bentrott, Vice President of Boeing Sales for the Middle East, Turkey, Russia, Central Asia and Africa. "The Dreamliner's unrivaled combination of superior fuel efficiency and reach makes it extremely flexible and will fit well with Air Tanzania operations, and we are confident that the 787 will boost passenger traffic and tourism in and out of Tanzania." Air Tanzania is headquartered in Dar es Salaam with its center at the Julius Nyerere International Airport. Currently, the airline flies to destinations throughout the region and plans to embark on intercontinental flights by the end of this year.